Salimetrics leads the industry in supporting thousands of salivary bioscience researchers around the world with the most accurate, highest-quality, salivary assays, saliva collection devices, and saliva testing services. Dedicated to the field of salivary bioscience, Salimetrics assays have been used in more saliva-related published papers than any other salivary assay in the field. Salimetrics is headquartered in the United States with locations in State College, Pennsylvania and Carlsbad, California, and also supports a global distribution network. At SalivaBio, we recognize the critical role saliva collection plays in providing consistent, accurate results. SalivaBio is dedicated to the creation of a global standard for collection devices and techniques, as well as the development of new, cutting edge saliva collection methods to increase ease of use and participant compliance. Exclusively from Salimetrics, all SalivaBio products are extensively tested to minimize or eliminate variability from saliva collection and have been optimized for collection with participant-specific groups. Not all saliva collection devices are the same, for example cotton swabs, can interact with analytes in the sample and/or negatively influence assay performance. SalivaBio collection devices have been tested on all Salimetrics assay kits and we have concrete recommendations for which device is compatible for testing the analytes in your study. Saliva samples can be collected in a convenient, minimally-invasive, and repeated manner. Saliva is a complex, heterogenous biospecimen which can lead to data errors if not collected properly. However, by following proper saliva collection and handling procedures high quality, reproducible data can be obtained from this sample type. To assist investigators in maximizing the integrity of their saliva samples, we offer the following advice. Knowledge about saliva testing is rapidly growing and being revised. The technical team at Salimetrics maintains the latest information and provides Ask an Expert support as part of our mission to support Salivary Bioscience. We advise consulting the literature on the analytes to be measured, and when the available literature appears inadequate, we strongly recommend a pilot study. It is ultimately each investigator’s responsibility to make decisions about the best methods to use for their specific study. For an additional discussion and current updates, we recommend signing up for The Salivary Bioscience Bulletin. Collection Time – Most hormones display a diurnal rhythm of expression, and this can be true for certain salivary proteins as well. Cortisol based research is especially impacted by the rhythm of cortisol expression through the course of the day – night cycle, and studies specific to diurnal expression of cortisol are central to study design. We suggest looking at the latest recommendations in the literature or reaching out to Ask an Expert for specific recommendations based on the analytes to be tested. For most research, sample collection should be made at specific times or within a window of time for the most meaningful measurements. Whenever possible, collection times should be accurately recorded to assess compliance with the desired sample collection intervals. Response and Recovery Characteristics – Sample collections should be timed to properly capture responses if a study involves interventions and stressors. This is true for longer interval studies spread over months, or lab-based stressor studies measuring stress responses. Absorbent devices may collect localized saliva rather than whole saliva, which may affect results for some analytes. Salivary levels of proteins such as alpha-Amylase and Secretory IgA do vary according to mouth location (6-8). We recommend placing absorbent devices in the location where saliva is pooling. For an adult or child sitting upright, the floor of the mouth (under the tongue) is the ideal location. For infants, adults, and children in a reclined position, we recommend turning the head to the side and collecting from the side of the cheek where saliva is “pooling”. When collecting saliva by passive drool, we recommend allowing saliva to pool under the tongue and gently propelling the collected drool into the tube through the straw-like collection aid. This sample will also be representative of saliva collected from all the salivary glands and eliminate any bias of collecting saliva from specific salivary glands. Levels of a few hydrophilic analytes, such as DHEA-S and/or larger proteins, such as SIgA, decrease as saliva flow rates increase, and salivary α-Amylase may also be similarly affected (9, 10). We currently advise that researchers covary the secretion rate (mL/min) for analytes such as α-Amylase, SIgA, and DHEA-S.
Record the total time necessary to collect the desired volume of saliva, so that assay results can be multiplied by the flow rate (mL/min) in order to express the results as a secretion rate (output per unit of time). To determine flow-rate if an absorbent device is used to collect saliva, weigh the swab and storage tube together before and after collection. (An approximate value of 1.0 g/mL may be assumed for the density of the saliva.) Also record the length of time the swab is in the mouth, so that flow rate can be estimated. The device must be removed from the mouth before it reaches its absorbance capacity or the estimate of flow rate will be inaccurate–due to the ceiling effect (6). Saturation is especially a concern for smaller devices, which can reach their limit fairly quickly. A pilot study may be necessary to determine the optimum collection period that is most likely to work for all participants. Salimetrics provides sample packs which may be used to assist in the development of the optimum collection period for a specific group of participants. Modern immunoassays are designed to use small sample volumes (less than 100 µL), and in most cases, stimulants are not required to collect adequate sample volume. We recommend against the use of oral stimulants when collecting saliva samples due to the possibility of causing assay interference or alteration of levels of some analytes (11); the goal should be to minimize unnecessary sources of variation in saliva test results. For example, even chewing on unflavored paraffin/wax could affect flow-dependent analytes. Use sparingly and in a consistent manner throughout the study (12). Consider using olfactory or visual stimulation before an oral stimulant is used. Try practicing with study participants before actual collection to ensure comfort with the methodology prior to collection for the actual study. Conduct a pilot study to ensure that the oral stimulant does not cause assay or analyte interference (11). Prior to sample collection, view analyte collection protocols or Ask an Expert concerning the sample volume requirement based on the number and type of assays to be performed. Participants should not brush their teeth within 45 minutes prior to sample collection (23). Dental work should not be performed within 24 hours prior to sample collection. Research participants should be screened for oral health problems or injuries. Saliva samples visibly contaminated with blood should be discarded and recollected (22). Samples collected from populations at high risk for oral health problems, may be screened with the Salimetrics Blood Contamination Assay Kit (Salimetrics Item 1-1302; 1-1302-5). It is critical that the collection protocol used is compatible with the analyte to be tested. Some analytes can only be tested with samples collected by passive drool. Using a swab to measure these analytes can result in over- or under-recovery of the analyte being measured. It is critical to research and follow basic analyte stability and storage recommendations prior to sample collection. Use only high-quality POLYPROPYLENE collection tubes and vials to store samples. Polystyrene or other non-validated plastic tubes can adversely affect the measured values of analytes. All SalivaBio collection tubes and vials are made from high quality polypropylene. 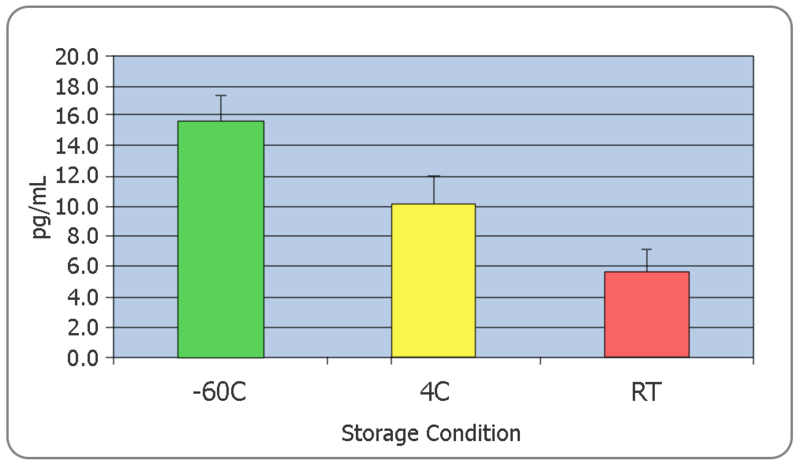 Effect of storage for 96 hours at three different temperatures on Salivary Estradiol levels (n=10). The effects of freeze thaw on most biological measures, regardless of biospecimen type, can be dramatic. As a general rule, multiple freeze-thaws should be avoided. For multi-analyte testing, the most practical way to address this concern is by aliquoting samples immediately after collection. Due to the viscous nature of saliva, this can be a tricky process, and aliquots of a sample may have slightly different values of the analyte of interest, but it is still more beneficial to avoid the dramatic impact of freeze thaws. Making aliquots after one freeze thaw and centrifugation creates a less viscous, more easily pipettable solution enabling researchers to generate more reproducible aliquots when required. Avoiding foods with high sugar or acidity, or high caffeine content, immediately before sample collection, since they may compromise the assay by lowering saliva pH and increasing bacterial growth (13, 14). Documenting consumption of alcohol, caffeine, nicotine, and prescription/over-the-counter medications within the prior 12 hours (15-18). Documenting vigorous physical activity and the presence of oral diseases or injury (19, 20). Not eating a major meal within 60 minutes of sample collection. Rinsing mouth with water to remove food residue and waiting at least 10 minutes after rinsing to avoid sample dilution before collecting saliva. Passive Drool Method: Most researchers prefer to use unstimulated, whole saliva collected by the passive drool technique in order to maintain consistency in the type of sample collected. Absorbent Device Method: Swabs can be placed in the mouth to collect saliva for increased ease of use. Studies with small children or other individuals that have difficulty with the passive drool technique also may require participant-specific swab-based collection methods. However, swabs are limited to certain analytes. All SalivaBio swabs are made from the same non-toxic, inert polymer which is guaranteed for consistency across all lots, making it ideal for longitudinal and multi-participant group studies. Passive drool is highly recommended because it is both cost effective and approved for use with almost all analytes and maintains sample integrity (see Passive Drool instructions). If research participants are not willing or able to drool saliva into a vial, the SalivaBio Oral Swab may be used as an alternative collection method, but only for certain analytes. To avoid problems with analyte retention or the introduction of contaminants, use validated polypropylene vials for collection, such as 2 ml cryovials, Salimetrics Item No. 5002.01. Vials must seal tightly, be able to withstand temperatures down to -80ºC, and must be externally threaded to allow for use of the Saliva Collection Aid (SCA – Salimetrics Item No. 5016.02) to effectively guide drool directly into the cryovial. If you are collecting saliva for biomarker analysis and may include genetic analysis, please see How to Collect Saliva for DNA Analysis before proceeding. Secretory IgA & DHEA-S concentrations in saliva are affected by saliva flow rate, and α-Amylase may also be affected. (6,9,10) See Effects of Flow Rate and Mouth Location, or contact us for details. 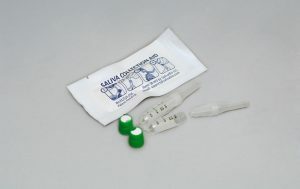 For certain analytes (see SOS instructions), the SalivaBio Oral Swab (SOS) (Item No. 5001.02) can be an excellent alternative to passive drool because of its ease of use. The SOS also helps filter large macro molecules and other particulate matter from the sample, which may help improve assay results. If centrifugation is not available, saliva from the swab may be expressed into a cryovial (Item No. 5002.01) using a needle-less 5 cc plastic syringe. However, expressing samples will result in smaller sample volumes. Due to the potential for choking when collection devices are placed in the mouth, collecting saliva from infants and children under the age of six requires special considerations. We recommend the SalivaBio Children’s Swab (SCS) (Item No. 5001.06), for children under the age of 6, and the SalivaBio Infant’s Swab (SIS) (Item No. 5001.08), for infants under 6 months of age. The extra-length SalivaBio Children’s Swab (SCS) (Item No. 5001.06), may also be used for saliva collection from infirmed adult patients to avoid any danger of choking. Follow the instructions provided. The SCS and SIS devices are manufactured in longer lengths and narrower widths to allow one end of the swab to be held by a parent or technician while the other end is placed in the child’s mouth. The diameters are appropriate for the size of children’s mouths. The polymer material is durable and can withstand chewing, and its taste and texture are also acceptable to children. The volume of sample recovered from the SCS and SIS is typically in the range of 200-1000 µL. Like the adult SOS, samples collected with either the SCS or the SIS may be tested for various analytes (see SCS instructions, see SIS instructions). All SalivaBio swabs are made from the same non-toxic, inert polymer which is guaranteed for consistency across all lots, making it ideal for longitudinal and multi-participant group studies. Collecting sufficient volume is essential to obtaining valid test results. Please refer to the Salimetrics guidelines for minimum collection volume for the analyte(s) you are testing. If immediate volume assessments are required, use a syringe as outlined in the Collection Method instructions for storing your sample. Biomarkers in saliva are increasingly being used to monitor the health and well-being of animals (e.g., salivary cortisol and stress in dogs) and this technology is continuously providing researchers the opportunity to achieve valid, consistent and repeatable conclusions in many biobehavioral studies. 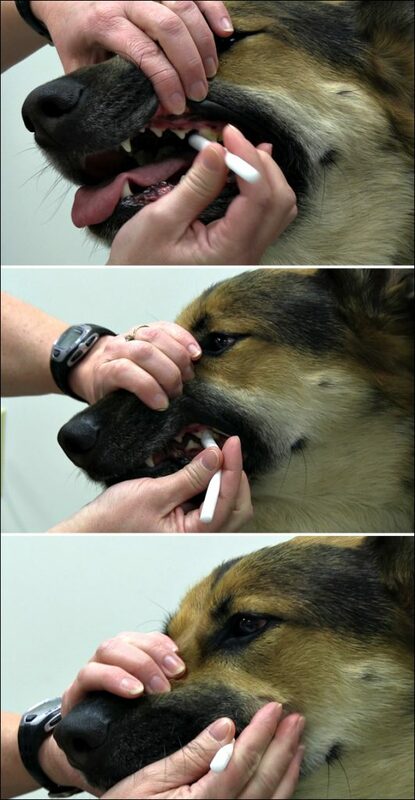 The first techniques such as cotton ropes, swabs, pads, Salivettes, hydrocellulose sponges, and other devices have been used to collect saliva from deer, guinea pigs, dogs, horses, primates, and other animal species (29-36). However, the latest saliva collection device technology and collection protocols have significantly reduced the burdens associated with previous collection methods. Salimetrics recommends SalivaBio’s Infant’s and Children’s Swab Devices as a validated method for collecting saliva from animals with mouths 8mm and larger in diameter to provide comfortable and safe saliva collection. Small Animals: The scientific literature contains various descriptions of techniques for saliva collection from mice and rats, such as capillary tubes, filter paper strips, plastic pipettes, and more sophisticated suction devices. However, Salimetrics & SalivaBio does not have direct experience with such methods and cannot advise on their use. SalivaBio Swab samples are preferred for salivary DNA analysis if Salimetrics is to perform DNA extraction. However, passive drool is also acceptable, and may be preferred if DNA extraction is to be performed by the researcher if high yields are critical for studies such as microarray genomic analysis. The Salimetrics’ in-house proprietary method for DNA extraction from swabs provides a yield of 2-5 µg/mL of high purity DNA, with a A260:A280 ratio of 1.8 or higher. DNA can also be obtained from samples that have already been collected for other analyte/biomarker analysis and does not normally require collection of new samples specifically for DNA. For salivary DNA testing, the pellet formed by centrifugation of samples contains cells that provide DNA. Do not discard the pellet or swab if genetic testing is desired. We do, however, recommend that the sample be frozen immediately and the pellet or the swab not be subjected to multiple freeze thaws to minimize degradation of DNA. Additional collection devices such as buccal swabs may be acceptable; Ask an Expert for the latest advice. When collecting buccal cells, be sure to rub the inside of cheeks for 30-60 seconds with firm pressure. The DNA sequence of every individual is constant throughout life. Samples can be pulled from different “waves” of your project and submitted for DNA testing. Freeze saliva samples as soon as possible. However, DNA can tolerate storage at room temperature for up to 5 days without compromising the quality of the DNA for some genetic testing (38). DNA also withstands multiple freeze-thaw cycles without significantly effecting DNA quality. If samples are to be tested for analytes in addition to DNA analysis, only use Salimetrics-validated collection methods and devices. Do not use a device which dilutes the saliva by an unknown amount or has the potential to interfere with the assays. In addition, follow storage instructions for the more sensitive analyte (i.e., the hormone or biomarker) of interest first. 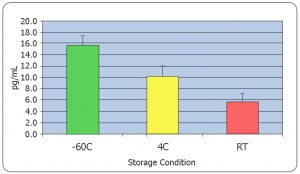 If room-temperature storage is necessary, the Oragene•DNA® self-collection kit (OG-500) may be used. Detailed collection and mailing instructions can be found in the Oragene•DNA kit package or at dnagenotek.com. For young children or people who are unable to drool freely, use the Oragene•DNA assisted collection format (OG-575) to collect whole saliva. ® Oragene is a registered trademark of DNA Genotek Inc. Employ only single-use materials (disposable forceps, etc.) for sample collection/transfer to prevent possible contamination between research subjects. Those researchers assisting with collections should wear gloves and avoid touching collection device materials and samples. Do NOT touch the swab or brushes with your fingers. Freeze samples at or below -20ºC (temperature of a household freezer) immediately after collection. SalivaBio Swab Collection: Samples can be frozen in the swab for up to 6 months with no decline in levels. However, if it is known ahead of time that samples may need to be stored for longer than 6 months, we recommend expressing the saliva out of the swab either by centrifugation or squeezing through a syringe immediately after collection, and storing the expressed saliva in cryovials, ideally at -80 C.
Samples can be stored at -80ºC for several years; the exact time has not yet been determined and may vary by analyte. However, many samples that have been stored properly for over four years have shown little or no degradation. We recommend you consult the literature or Ask an Expert for details. On the day samples are to be assayed, bring samples to room temperature, vortex, and then centrifuge at 1500 x g for 15 minutes. If the samples appear viscous, centrifuge at a higher speed such as 2500 x g or break up the clot with a pipette tip and re-centrifuge. Assays should be performed using only clear saliva, avoiding the pellet formed at the bottom of the tube. When pipetting viscous solutions such as saliva, greater accuracy is obtained by aspirating slowly to avoid the formation of bubbles. Vortex and re-centrifuge tubes following each freeze-thaw cycle since additional precipitates may develop upon refreezing. If samples will be used for genetic analysis, it is important to keep the cell sediment at the bottom of your whole saliva sample or contained in the swab device. West, C.D., Mahajan, D.K., Chavre, V.J., et al. (1973). Simultaneous measurement of multiple plasma steroids by radioimmunoassay demonstrating episodic secretion. J Clin Endocrinol Metab, 36(6), 1230-36. Dorn, L.D., Lucke, J.F., Loucks, T.L., & Berga, S.L. (2007). Salivary cortisol reflects serum cortisol: Analysis of circadian profiles. Ann Clin Biochem, 44(pt3), 281-84. Nater, U.M., Rohleder, N., Schlotz, W., et al. (2007). Determinants of the diurnal course of salivary alpha-amylase. Psychoneuroendocrinology, 32(4), 392-401. Krieger, D.T. (1975). Rhythms of ACTH and corticosteroid secretion in health and disease and their experimental modification. J Steroid Biochem, 6(5), 758-91. Rohleder, N. & Nater, U.M. (2009). Determinants of salivary α-amylase in humans and methodological considerations. Psychoneuroendocrinology, 34(4), 469-85. Beltzer, E.K., Fortunato, C.K., Guaderrama, M.M., et al. (2010). Salivary flow and alpha-amylase: Collection technique, duration, and oral fluid type. Physiol Behav, 101(2), 289-96. Crawford, J.M., Taubman, M.A., & Smith, D.J. (1975). Minor salivary glands as a major source of secretory immunoglobin A in the human oral cavity. Science 190 (4220), 1206-9. Veerman, E.C., van den Keybus, P.A., Vissink, A., & Nieuw Amerongen, A.V. (1996). Human glandular salivas: Their separate collection and analysis. Eur J Oral Sci 104(4), 346-52. Kugler, J., Hess, M., & Haake, D. (1992). Secretion of salivary immunoglobulin A in relation to age, saliva flow, mood states, secretion of albumin, cortisol, and catecholamines in saliva. J Clin Immunol, 12(1), 45-9. Vining, R.F., McGinley, R., & Symons, R.G. (1983). Hormones in saliva: Mode of entry and consequent implications for clinical interpretation. Clin Chem, 29(10), 1752-56. Granger, D.A., Kivlighan, K.T., Fortunato, C., et al. (2007). Integration of salivary biomarkers into developmental and behaviorally-oriented research: Problems and solutions for collecting specimens. Physiol Behav, 92(4), 583-90. Talge, N.M., Conzella, B., Kryzer, E.M., et al. (2005). It’s not that bad: Error introduced by oral stimulants in salivary cortisol research. Dev Psychobiol, 47(4), 369-76. Klein, L.C., Whetzel, C.A., Bennett, J.M., et al. (2010). Caffeine and stress alter salivary alpha-amylase activity in young men. Human Psychopharmacology Clinical and Experimental, 29, 359-367. Schwartz, E., Granger, D.A., Susman, E.J., et al. (1998). Assessing salivary cortisol in studies of child development. Child Dev, 69(6), 1503-13. Granger, D.A., Blair, C., Willoughby, M., et al. (2007). Individual differences in salivary cortisol and α-amylase in mothers and their infants: Relation to tobacco smoke exposure. Dev Psychobiol, 49(7), 692-701. Hibel, L.C., Granger, D.A., Cicchetti, D., & Rogosch, F. (2007). Salivary biomarker levels and diurnal variation: Associations with medications prescribed to control children’s problem behavior. Child Dev, 78(3), 927-37. Granger, D. A., Hibel , L. C., Fortunato, C. K., & Kapelewski, C. H. (2009). Medication effects on salivary cortisol: Tactics and strategy to minimize impact in behavioral and developmental science. Psychoneuroendocrinology, 34, 1437-1448. Hibel, L.C., Granger, D.A., Kivlighan, K.T., & Blair, C. (2006). Individual differences in salivary cortisol: Effects of common over the counter and prescription medications in infants and their mothers. Horm Behav, 50(2), 293-300. Kivlighan, K.T. & Granger, D.A. (2006). Salivary α-amylase response to competition: Relation to gender, previous experience, and attitudes. Psychoneuroendocrinology, 31(6), 703-14. Henskens, Y.M., van den Keijbus, P.A., Veerman, E.C., et al. (1996). Protein composition of whole and parotid saliva in healthy and periodontitis subjects: Determination of cystatins, albumin, amylase and IgA. J Periodont Res, 31(1), 57-65. Schwartz, E. & Granger, D.A. (2004). Transferrin enzyme immunoassay for quantitative monitoring of blood contamination in saliva. Clin Chem, 50(3), 654-56. Kivlighan, K.T., Granger, D.A., Schwartz, E.B. Blood contamination and the measurement of salivary progesterone and estradiol. Horm Behav, 47(3), 367-70. Whembolua, G.L., Granger, D.A., Singer, S., et al. (2006). Bacteria in the oral mucosa and its effects on the measurement of cortisol, dehydroepiandrosterone, and testosterone in saliva. Horm Behav, 49(4), 478-83.
de Weerth, C., Jansen, J., Vos, M.H., et al. (2007). A new device for collecting saliva for cortisol determination. Psychoneuroendocrinology, 32(8-10), 1144-48. Harmon, A., Hibel, L.C., Rumyantseva, O., & Granger, D. A. (2007). Measuring salivary cortisol in studies of child development: Watch out–what goes in may not come out of commonly used saliva collection devices. Dev Psychobiol, 49(5), 495-500. Shirtcliff, E.A., Granger, D.A., Schwartz, E., & Curran, M. J. (2001). Use of salivary biomarkers in biobehavioral research: Cotton based sample collection methods can interfere with salivary immunoassay results. Psychoneuroendocrinology, 26(2), 165-73. Millspaugh, J.J., Washburn, B.E., Milanick, M.A., et al. (2002). Non invasive techniques for stress assessment in white-tailed deer. Wildlife Society Bulletin, 30(3), 899-907. Emack, J., Kostaki, A., Walker, C.D., & Matthews, S.G. (2008). Chronic maternal stress affects growth behavior and hypothalamo-pituitary-adrenal function in juvenile offspring. Horm Behav, 54(4), 514-20. Lutz, C.K., Tiefenbacher, S., Jorgensen, M.J., et al. (2000). Techniques for collecting saliva from awake, unrestrained adult monkeys for cortisol assay. Am J Primatol, 52(2), 93-99. Newman, J.L., Perry, J.L., & Carroll, M.E. (2007). Social stimuli enhance phencyclidine (PCP) self-administration in rhesus monkeys. Pharmacol Biochem Behav, 87(2), 280-88. Horvath, Z., Igyártó, B.Z., Magyar, A., & Miklósi, Á. (2007). Three different coping styles in police dogs exposed to a short-term challenge. Horm Behav, 52(5), 621-30. Dreschel, N.A. & Granger, D.A. (2009). Methods of collection for salivary cortisol measurement in dogs. Horm Behav, 55(1), 163-8. Dreschel, N.A. & Granger, D. A. (in press). Advancing the social neuroscience of human-animal interaction: The role of salivary bioscience. In “The Social Neuroscience of Human-Animal Interaction (Eds., L. Freund, S. McCune, P. McCardle, L. Esposito & J. Griffin, Eds). Gutiérrez, A.M., Martínez-Subiela, S., Eckersall, P.D., & Cerón, J.J. (2009). C-reactive protein quantification in porcine saliva: A minimally invasive test for pig health monitoring. Vet J, 181(3), 261-5. Gómez, A., Jewell, E., Walker, S., & Brown, J. (2004). Use of salivary steroid analyses to assess ovarian cycles in an Indian rhinoceros at the National Zoological Park. Zoo Biol, 23, 501-12. Nemoda, Z., Horvat-Gordon, M., Fortunato, C.K., Beltzer, E.K., Scholl, J.L., & Granger, D.A. (2012). Assessing genetic polymorphisms using DNA extracted from cells present in saliva samples. BMC Med Res Methodol, 11, 170. Vermeer, H.J., Van Ijzendoorn, M.H., Groeneveld, M.G., & Granger, D.A. (2012). Downregulation of the immune system in low-quality day care: The case of secretory immunoglobulin A (SIgA) in toddlers. Physiology and Behavior, 105, 161-170. D., Granger, D. A., Sephton, S. E., & Segerstrom, S. C. (2013). Disentangling sources of individual differences in diurnal salivary alpha-amylase: Reliability, stability, and sensitivity to context. Psychoneuroendocrinology. Geisbrecht, G. F., Granger, D.A., Campbell, T., Kaplan, T. and the APrON Study Team. (2013). Salivary alpha-amylase during pregnancy: Diurnal course and associations with obstetric history, maternal characteristics and mood. Developmental Psychobiology. Out, D., Hall, R. J., Granger, D.A., Page, G. G., & Woods, S. J. (2012) Assessing salivary C-reactive protein: Longitudinal associations with systemic inflammation and cardiovascular disease risk in women exposed to intimate partner violence. Brain, Behavior, and Immunity , 26, 543-551. Wilde, C. Out, D., Johnson, S., & Granger, D. A. (in press). Sample collection, including participant preparation and sample handling. In D. Wild (ed. ), The Handbook of Immunoassay, Elsevier, London.